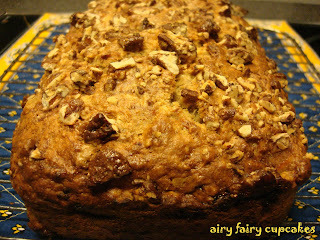 ~airy fairy cupcakes~: cupcakes take a back seat while Banana Bread rides up front to the Banana Bread Bakeoff! cupcakes take a back seat while Banana Bread rides up front to the Banana Bread Bakeoff! 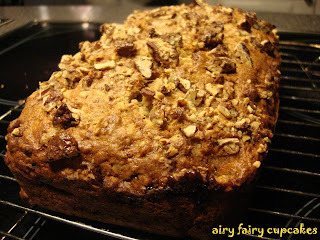 ok, so i'm ALWAYS up for a foodie event and when i encouraged my friend in blogdom, Not Quite Nigella to host a Banana Bread Bakeoff...well i couldn't very well NOT participate. so the event was for Banana Bread and to be honest, i've never made it before in the loaf form...i've made banana cupcakes but it didn't really feel like the same thing. there is something so wholesome and good about slicing up a loaf of bread. so i hid the cupcake cases away and dusted off a silicone loaf mould that i found abandoned and long since unused at the bottom of one of the cupboards. i also thought about what recipe i wanted to use. i searched the internet and found many, many recipes...how to choose? then i thought about looking for a recipe from closer to home. one of my favourite places to eat in Ireland is at the Avoca Cafes. 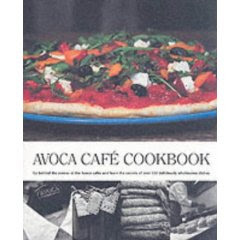 there are a whole string of them around our island and the food is just so good and homely (you might remember that i posted about the one in Powerscourt which i visited on my birthday) so i figured their recipe in the Avoca Cafe Cookbook has got to be good. so i located their banana bread recipe and set to work. the recipe was SUPER easy to follow and do...no mixer, nothing...just a little bit of arm work and then again, not much of that either. i must admit though that i started to freak out a bit when i saw the consistency of the batter...it was so...THICK! this serves me right for being a cupcake addict...i have obviously forgotten that one consistency does not suit all! i had this moment of 'oh no, my banana bread is going to be a banana brick...heavy and dense!' but was i ever wrong? the recipe called for pecans and i was lucky that while at the market (buying up the fudge store) i also spied the nut stall and bought some honey roasted pecans which really were to die for. 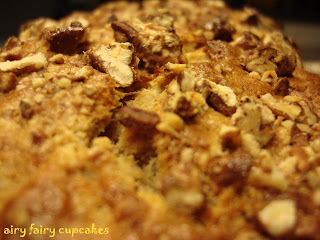 they were crunchy, sweet and just perfect for putting in banana bread. you might just be able to make them out in the second row, extreme right of the photo. the pecans were so good that as well as putting them in the batter i also sprinkled them on top of the banana bread before baking. the result when the bread came out of the oven was lovely! the taste was really really good. my brother demanded a second piece straight away! 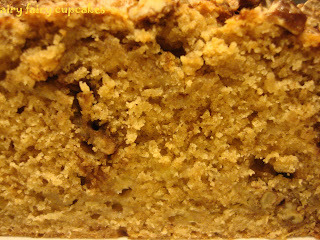 the amount of banana was perfect (i mean c'mon, i want my banana bread to taste of banana!) and with that bit of cinnamon, it gave you such a warm feeling. the honey roasted pecans were perfect! they made the outside of the bread crunchy and provided a lovely little crunch throughout the bread as well as a fantastic flavour. i'm guessing you could do these yourself in the oven, but i'm imagining mess and goo and everything else that usually comes with honey! i didn't mash up the bananas to the point of baby food, so there were still some obvious bits of banana throughout the bread. i like that! to me it feels more wholesome. i will DEFINITELY get that silicone mould out again to bake this because it was so good. i mean, really, anything that was baked by 9pm last night and was gone by 10 am this morning must be good. 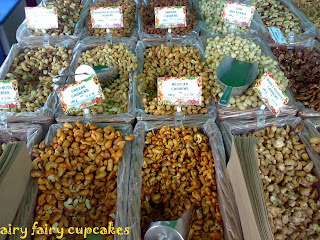 i'm also going to go back to the nut stall and experiment with some other varieties and maybe try some white chocolate chips in there too. oh, it could be so much fun! the possibilities are endless! preheat your oven to whatever usually works best for you. sift flour, salt, baking powder and cinnamon into a bowl, stir in sugar. mix in egg, butter and vanilla essence, but do not beat. fold in pecans and mashed bananas, using a fork. again do not beat. spoon into loaf tin and bake for 50-60 mins. leave for 10 mins in the tin and then cool on a wire rack. it doesn't get much easier than that! devour shamelessly! Isn't Banana bread great how you don't need the heavy equipment? Sometimes I just like to stir, plonk into tin and bake. absolutely lorraine! i LOVE how easy this is...probably the easiest and fastest baked good i've made in ages. it was such a joy...no creaming, no mixer...brilliant! thanks again for a great event and helping me discover the wonder of banana bread! Lovely bread ... you make it look so easy!! 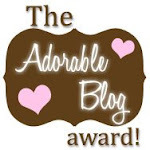 BTW - Love you Blog ~ SO CUTE!!! thanks swati...this one really is easy! hi dana, you should definitely try it. i made it again today and used regular pecans but drizzled with butterscotch sauce on top and again there was this lovely caramel taste. delicious! honey roasted pecans, you say? sign me up. i like banana breads like this because i can eat them for breakfast and still just tell myself that i'm eating a slice of bread. hi michelle, tell me about! my thinking exactly! anything to squeeze in a treat to satisfy my sweet tooth! The avoca banana bread is just the bestest ever!! along with their carrot cake!!! Love the nuts on top must try that the next time!!! hi rachel...i must try the carrot cake if it's as good as you say because i love carrot cake too! the nuts on top worked really well especially those honey roasted pecans...which you can find at the local farmer's market...i get mine when it comes to Howth on a Sunday along with an array of other divine goodies! 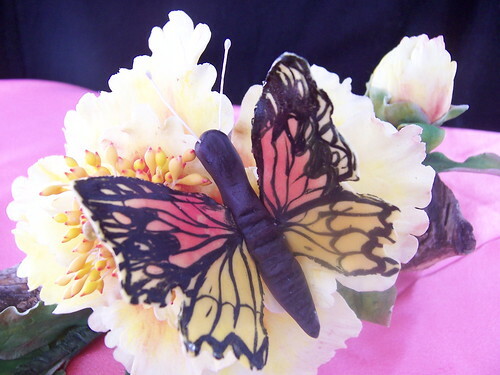 hee, i just posted this event for you... should have kept reading! i am going to make both your banana breads. That looks scrumptious!!! You should enter it into another banana bread contest (winner gets a $50 gift card to Sur La Table). Plus you'll get more links to your website!! thanks clever monkey...hope u tried the bread and liked it! Hello I was wondering what temperature would you recommend for baking this banana bread on? Hi there. I think the 1 teaspoon of salt is too much. I love a hit of saltiness to offset the sweetness of the banana, but I think half a tsp would be plenty. Thanks for the recipe. 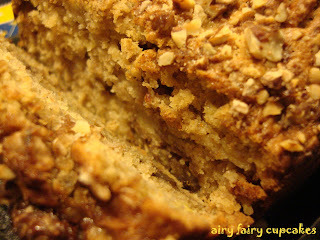 yummy it look delicious, I really want to do this recipe! I will share it with my family! thanks for sharing!